Handmade Wedding Invites with butterfly design "Harris" Beautiful metal butterflies in black ..
Beautiful, personalised handmade cards for all occasions; birthday, Christmas, Wedding Day and Special wedding anniversaries. 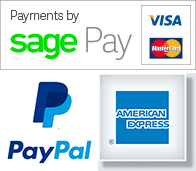 We also design and create luxurious handmade wedding invitations. 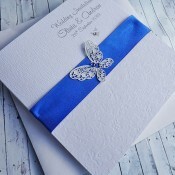 All our wedding invites can be personalised especially for you. Our beautiful save the date cards and invitations will set the tone for your special day, while our matching 'on the day' stationery includes orders of service, wedding menus, place cards, bespoke table plans and wedding guest books to impress your guests and add a touch of glamour and sparkle. 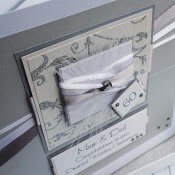 All of our wedding invitations are hand made to order and can be adapted to suit your chosen colour scheme and style and, most importantly, your budget. Have a browse through our design gallery and remember that all designs can be made in any colour scheme. 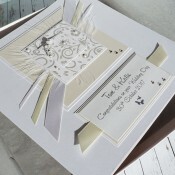 Personalised 50th Wedding Anniversary Card "Gold Sparkle" A handmade card for mum & dad, ..